Symbiosis Institute of Business Management, Bengaluru hosted 13 stories of change that took unyielding grit, determination, passion along with an undying urge to leave this world a better place than they found it. 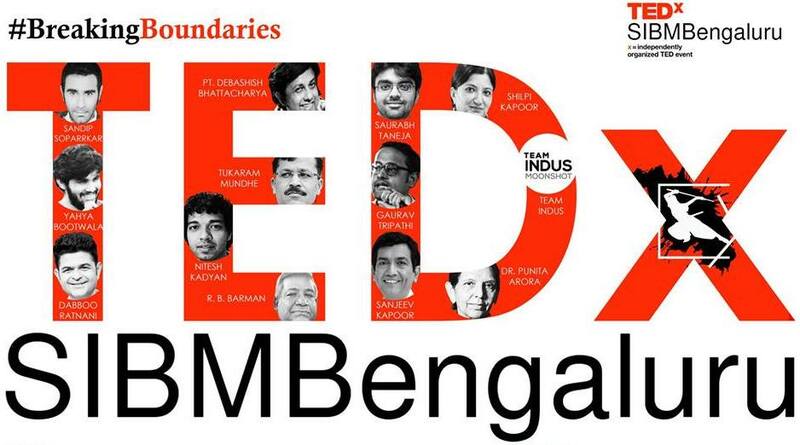 The 7th edition of TEDxSIBMBengaluru 2018 experienced all of these come to life. The 13 speakers from across different domains shared the stories of #BreakingBoundaries and leaving behind the monotony or conventional thought process of the Indian Society. Pt. Debashish Bhattacharya, an Indian Classical Musician, combined the Indian Musical Culture with the Western kind and created a fusion that mesmerised the audience. His beliefs about “how a pitch brings melody and melody bring expressions” couldn’t have been conveyed in a way any better. One of the most promising prospects for space explorations in India is Team Indus and Protik Banerji, Flight Software Engineer, explained how their journey started towards having their own Moonshot. These young group of lads literally broke the boundaries in their upcoming mission to reach the moon. “We landed upon Moon, but wait, the job isn’t done yet, we need to go beyond, even beyond the stars”, exclaimed the engineer. The organising team worked sincerely for more than two months to create what can be easily said their Magnum Opus. The audience clearly appreciated the execution of the entire programme and with their responses, it can be easily said the TEDxSIBMBengaluru has Broken Boundaries in totality.